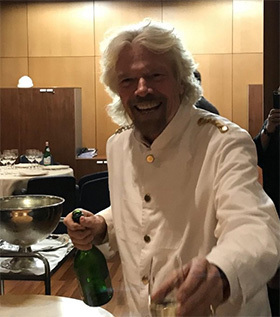 Having just joined Sir Richard Branson for the keel laying and initial "reveal" of his first Virgin Voyages "lady ship" - I have some exciting news to share! First and foremost - the Virgin Voyages vessels (three on order) will be the first ever "adult by design" cruise ships. We've had adult-only all-inclusive resorts for years - but not one "mass market" cruise line has been previously willing to create ships for adult-only vacations. So what does "adult-only" mean? All of the dining, entertainment, shore excursions, activities - will be geared toward those aged 18 and above - which means the crew won't have to worry about kids programs, kids menus and kiddie parades throughout the ships. Shows won't need to be tempered for young ears. Guests can dine without worrying if the table next to them will have a crying baby or "spirited" adolescent. No more "adult-only" venues - because ALL of the venues will be adult only! Of the 2800 berths - 93% of them will have ocean views, while 86% will feature "sea terraces" which on all other ships are called "verandas or balconies". Get ready for lots of new lingo. Everyone who works for Virgin Voyages - on land and at sea will be referred to as "crew". Passengers are called "sailors". This is just the beginning. Although little was revealed by Sir Richard and his team - we suspect that most of the traditional "cruisie" concepts will either be altered or eliminated. In true Virgin style - begin to think differently. Remove the gimmicks and the gadgets. Look for more eclectic food outlets, edgy entertainment options and exciting onboard programming. Virgin Voyages will be far more like a floating resort than a cruise ship. We do know that the first ship will be introduced in 2020 to sail r/t Miami - likely on seven-night voyages. Where will the ship sail? Even that is supposed to be "different" and reimagined. Perhaps Branson will figure out how to get 2800 guests onto Necker Island? With this billionaire and adventure-seeker at the helm - anything is possible. Itineraries will be announced in the third quarter of 2018.